Tires, just like on your vehicle you drive wear over time. They develop cuts and tears, and the lugs wear and round over through use and time, especially on you RC Crawlers and Monster Trucks. You should pay attention to the forward leading edges of the lugs and watch for wear, while at the same time noticing the essentially non-wear of the rear leading edge of the lugs. Tires grip the best when they are new and the lugs are sharp. Once the lugs begin to wear, "You'll notice more slippage and spinning." That's when it is time to rotate the tires. Once the edges of the lugs are rounded off on both the front and rear lugs, then it is time to think about putting on a new set and using those just replaced for playing around and goofing off. 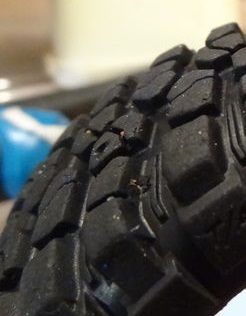 A new set will assure the grip needed and can be the difference of scaling that obstacle without the fear of breaking your RC crawler or RC monster truck that you have put some much time and money into because your running on insufficient tires.